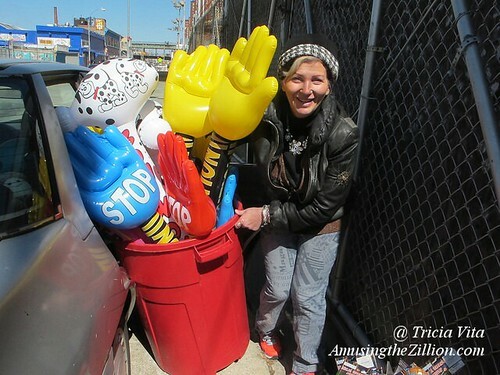 Photo of the Day: Happy Mermaid Parade Day! Happy Mermaid Day! Today is the 33rd Annual Mermaid Parade produced by non-profit arts org Coney Island USA. America’s largest art parade is worth the trip from anywhere. If you plan to march as a mermaid or other sea creature, or simply watch it from the curb or the boardwalk, we recommend getting here early, say 11:00am. To avoid traffic jams, take the D, F, N or Q train to Stillwell Avenue and leave your car at home unless it’s one of the vintage cars in the Parade. 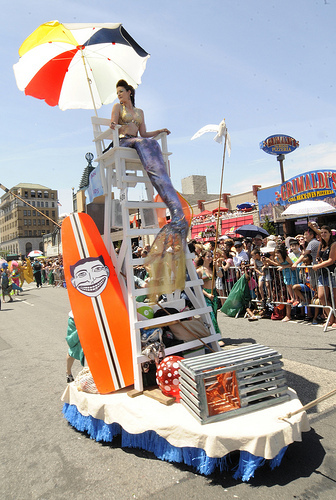 The Mermaid Parade starts rolling down Surf Avenue at 1:00pm, but parade-goers can also take photos in the staging area on West 21st Street from 10:30am till 12:30pm, for a fee of $20. Check out our post from last year, Fave Spots to Photograph Coney Island’s Mermaid Parade (ATZ, June 19, 2014). Although the Mermaid Parade is free to watch, it costs a lot of clams to produce, say the folks at Coney Island USA, who are trying a new method of fundraising this year. Fans of the Parade are being asked to text MERMAID to 91999 and make a donation. Everyone who makes a text donation of $20 or more on the day of the Parade will be entered into a raffle for 5 pairs of tickets to one of several Off Broadway shows. There will be no Mermaid Ball this year due to lack of a suitable venue. Make your own after-party by patronizing Coney Island USA’s Sideshow and Freak Bar, and the Coney Island businesses sponsoring the Parade including Luna Park, Deno’s Wonder Wheel Park, Coney Island Brewing Company, Coney Island Smorgasburg, Dona Zita, Eldorado Bumper Cars, Gyro Corner, Paul’s Daughter, Peggy O’Neills, Ruby’s Bar and Williams Candy Shop. 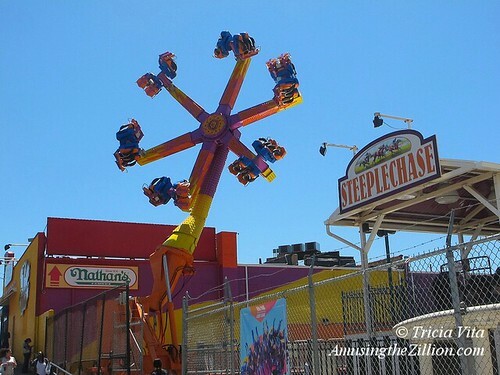 There’s a chance of snow showers on Saturday, but it’s expected to be sunny with temps in the 40s on Palm Sunday, when Coney Island’s rides go for their first spin of the season. In celebration of the landmark Wonder Wheel’s 95th year, the first 95 people will get a free ride on Opening Day. The soon-to-be 88-year-old Cyclone roller coaster will as usual offer free rides to the first 100 on line. Erik Knapp aka Mr. Cyclone is once again expected to arrive the night before to be the first on line. On Saturday, the Boardwalk businesses Ruby’s Bar and Lola Star Boutique will welcome customers for the first time since last fall, joining Tom’s Restaurant and Brooklyn Beach Shop, which are already open daily. Saturday night is Coney Island USA’s spring gala, which is being held at the art organization’s Surf Avenue headquarters on the eve of Coney’s Opening Day. Featuring performances by burlesque and sideshow stars including Mat Fraser of “American Horror Story,” live music, and go go dancers in the Freak Bar, the event runs from 8pm till midnight. The annual fundraiser supports Coney Island USA’s Mermaid Parade, Coney Island Circus Sideshow, Burlesque at the Beach, Coney Island Museum and Coney Island Film Festival. General admission of $100 includes unlimited beer, wine, and food. VIP admission of $150 also includes one hour earlier admission at 7pm, Meet and Greet with some of the performers in the V.I.P. Lounge, and gift bags. Tickets may be purchased online until 10pm on Friday. Day of tickets available from 6pm and during the gala at Coney Island USA. 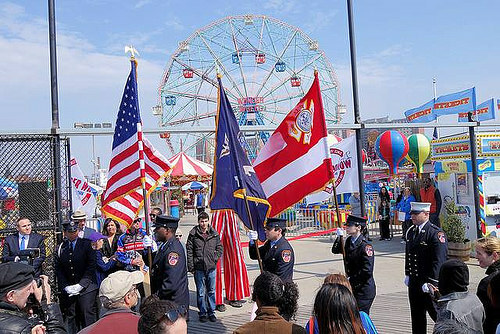 On Palm Sunday, the festivities begin at 10:30am on the Boardwalk with the Blessing of the Rides at Deno’s Wonder Wheel Park by Pastor Debbie Santiago of Coney Island’s Salt and Sea Mission, speeches by elected officials, and the FDNY color guard presenting the Colors and singing the National Anthem. After a ribbon cutting ceremony at Deno’s gate, the gathering moves to the Cyclone roller coaster, which is operated by Luna Park. Brooklyn’s Borough President performs the traditional Egg Cream Christening of the front car of the Cyclone, after which it goes for its inaugural ride of the season. 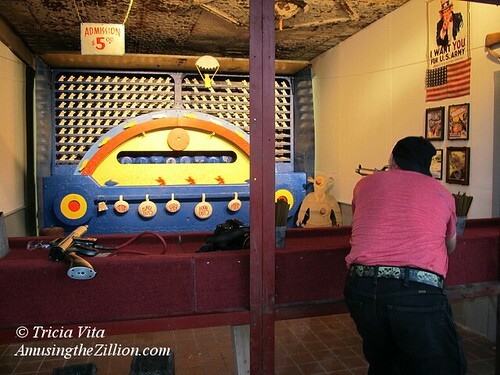 The Coney Island Circus Sideshow will run continuously on Palm Sunday from 1pm – 8pm. Tickets are $10 for adults, $5 for kids under 12. 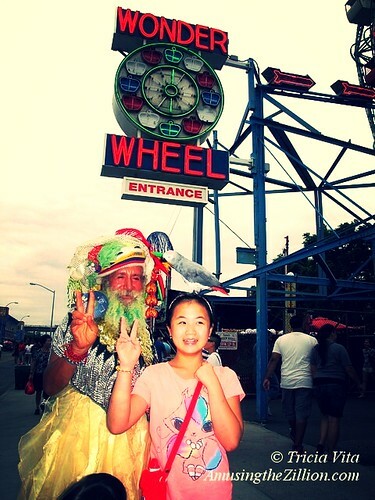 The Coney Island History Project, located on West 12th Street under the Wonder Wheel sign, will be open special hours from 1pm-6pm for a preview of the 2015 season and free souvenir photos with vintage ride figures. Admission is free of charge. 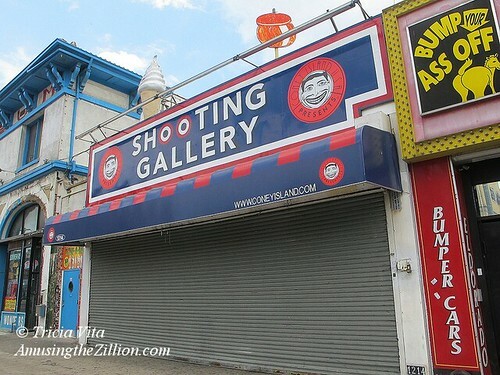 Also opening on Palm Sunday are 12th Street Amusements and the remaining independent concessions on the Bowery and West 12th Street, including the dancing doll “Miss Coney Island,” the animated windows of “Coney Island Always,” games of skill such as Skin the Wire and Feed the Clown, and Monica, the High Striker Queen of Coney Island. Already world-famous for its New Year’s Day Polar Bear Plunge, Coney Island is having its first-ever New Year’s Eve celebration on Wednesday and first fireworks show of 2015. 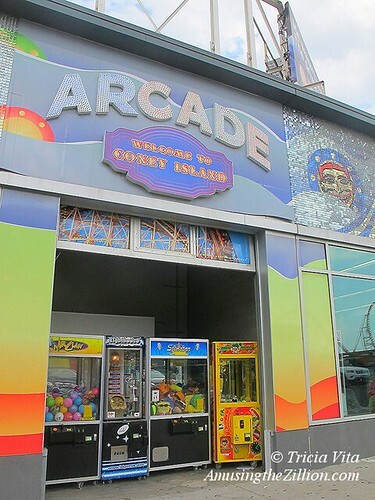 The free event will feature a digital “ball drop” on the illuminated Parachute Jump, live entertainment by the Coney Island Circus Sideshow and a fireworks extravaganza. 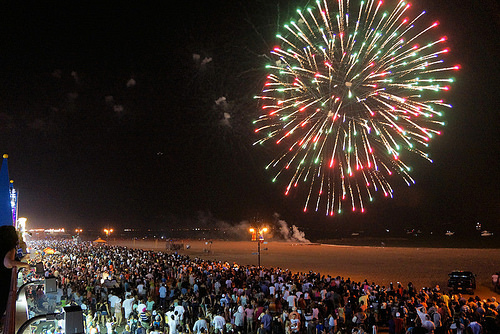 The idea originated with Brooklyn Borough President Eric Adams, who vowed to bring a New Year’s Eve celebration to Coney Island when he was elected last year. “Now that we have our very own seaside ball drop, why be squished like a sardine in Times Square when you can rejoice like royalty in the County of Kings!” said Adams, who plans to make it an annual tradition. 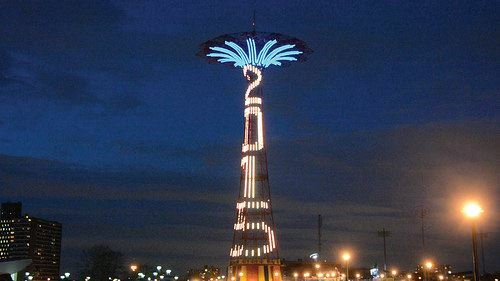 The 1939 Parachute Jump, which is known as Brooklyn’s Eiffel Tower, is bedecked with 8,000 LEDs and lit year-round, but this is the landmark’s debut as the centerpiece of a celebration. 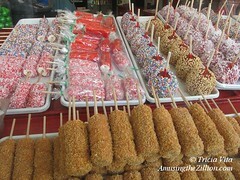 Adams teamed up with Coney’s City Councilman Mark Treyger and the Alliance for Coney Island to sponsor the festivities. The fun starts at 9:00pm with a DJ spinning at the Jump, which is located on the boardwalk just west of 16th Street. Revelers will be treated to giveaways as well as complimentary hot chocolate. Sideshow performances and live music begin around 11:00pm 10:30pm with the ball drop at midnight followed by fireworks shot off from the beach. A number of local bars and eateries will be open for New Year’s Eve and offering extended hours. Tom’s Coney Island, the Boardwalk outpost of the Prospect Park eatery, which has a full bar, will be serving till 12:30am. The original Nathan’s Famous on Surf Avenue will be open till midnight. Surf Avenue restaurants with bars keeping later hours–till 1 or 2am– are Peggy O’Neill’s (1904 Surf Ave.), Footprints (1521 Surf Ave.) and Applebee’s (1217 Surf Ave.). Dunkin Donuts in Stillwell Terminal is open 24 hours. 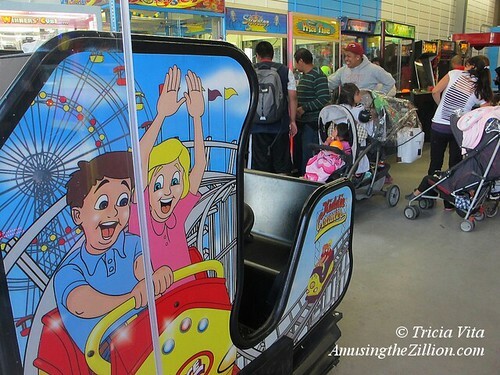 Eldorado Bumper Cars (1216 Surf Ave.) will be open till 1:00am. All will be open again for Thursday’s Polar Bear Dip. 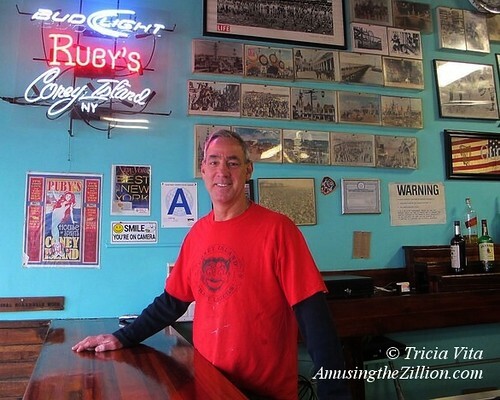 On New Year’s Day, the fun starts up again at 10am, when Ruby’s Bar, Coney Island’s oldest, will open early to welcome participants of the Polar Bear Dip. Swim time is 1pm sharp and you can avoid long lines by registering in advance online and making a minimum $20 donation to the fundraiser for Camp Sunshine, where children with life-threatening illnesses and their families can enjoy a summer vacation. 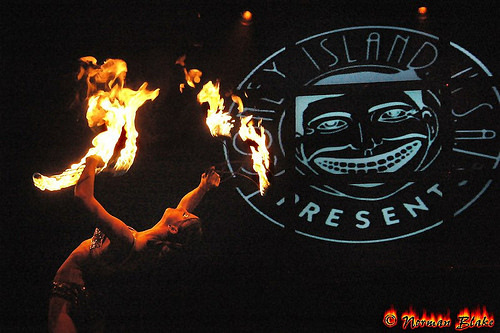 Coney Island USA’s Sideshow and Freak Bar will be open from 2-6pm on New Year’s Day. Coney Island’s official parking lot next to MCU Park will be open and FREE for both New Year’s Eve and the New Year’s Day Polar Bear Dip.